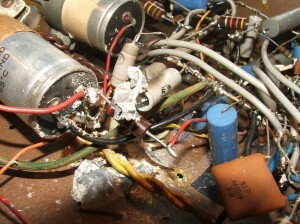 Here’s a picture of something you don’t want to see in your amp. The grey tube in the centre of the pic is (was) an electrolytic capacitor. The silver foil stuff used to be inside the tube. Needless to say, it doesn’t work anymore. So what did it do, what is it there for, and why doesn’t it do it anymore? 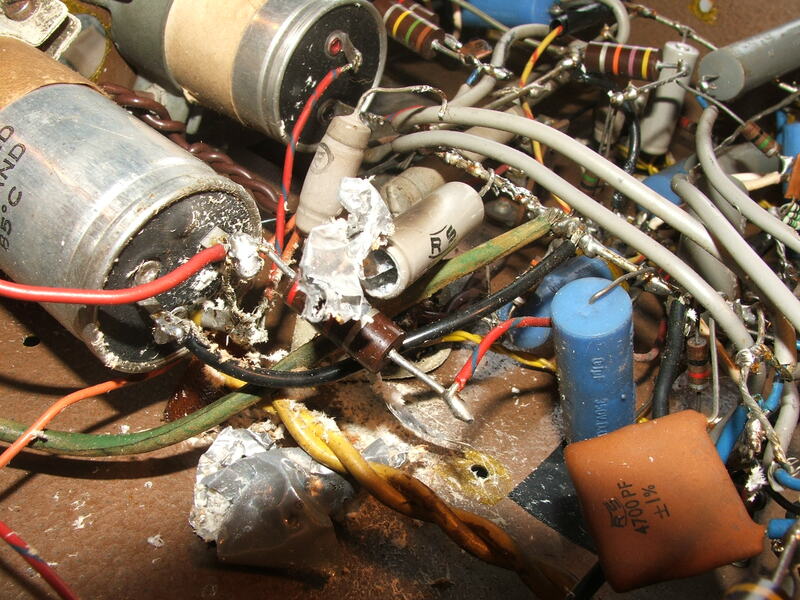 The destroyed capacitor in the pic is the bypass capacitor in the schematic diagram above. The purpose of bias voltage in any valve circuit (and also in semiconductor circuits) is to control the current through the valve (or transistor). The grid 1, which is also called the control grid, is held at a negative voltage to the cathode voltage. So if the cathode was at zero volts (ground) the grid would be held at around - (that’s ‘minus’) 36 to 40 volts. The effect of this bias voltage, which is d.c. and is set to a predetermined value, is to ‘pinch’ the current through the valve, to say, a few tens of milliamps, though this varies considerably and sets the ‘class’ of the valve operation. Class A has least bias volts, Class AB, AB1, AB2, have different levels of bias voltage. But elsewhere on this blog there are more details about biasing and the class of operation of amps. Associated with this capacitor is the cathode bias resistor. There are two different ways of applying the control grid bias voltage. One is to apply the negative voltage from a source straight to the grid. This kind of bias is adjustable and often has a preset pot to vary the bias voltage. The other way of doing it is to put a resistor (the cathode bias resistor) between the cathode and ground. This does effectively the same thing, that is produces a grid voltage that is negative to the cathode, but it does it differently. The current through the valve develops a voltage across the cathode resistor which means that, by raising the cathode voltage, and leaving the grid at zero, the grid is effectively at a lower voltage than the cathode. The bigger the cathode resistor, the more the bias voltage. The capacitor bypasses the signal (sound component) of the current through the resistor. This is known as ‘fixed bias’ or ‘automatic bias’. And now we get to the reason for the blown cap. If for some reason the valve goes soft (also known as red plate or short) the current through the valve multiplies. This often because the internal elements (often grid/cathode) distort and short within the valve. The cathode bias resistor is in the main current path of the valve and the voltage across it increases beyond the working voltage of the bypass cap. The cap doesn’t like this at all, and does what it did. Another cause of this symptom is the bias resistor itself which can open circuit (as this one did). But the result (and the reason for it) is the same. The best know amp to use this kind of bias is the Vox AC 30 (and also AC 15) , but there is a difference. In the Vox’s all the output valve cathodes are connected together and have a common bias resistor/bypass capacitor arrangement. 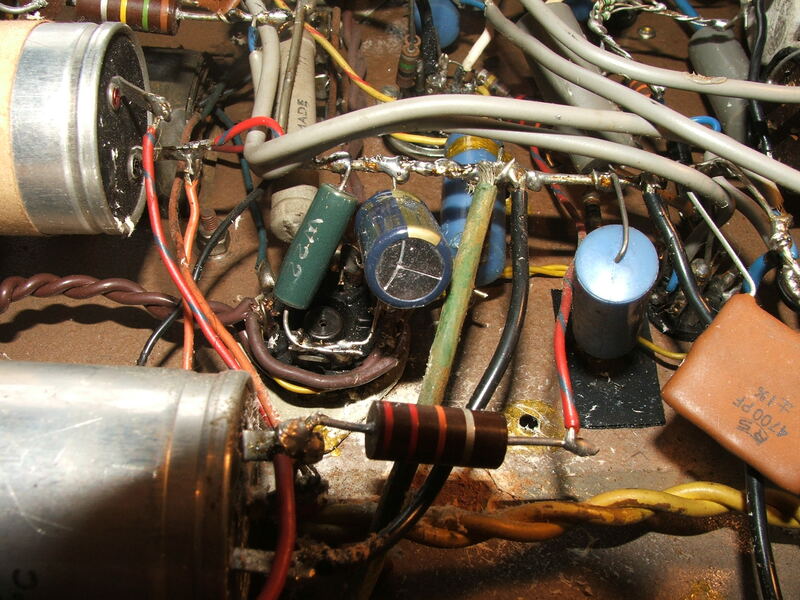 In this RSC amp, each output valve had its own seperate circuit. And this is the replacement bias network. After a a blowout like this, it’s a good idea to check for tracking and burning on the valve base.